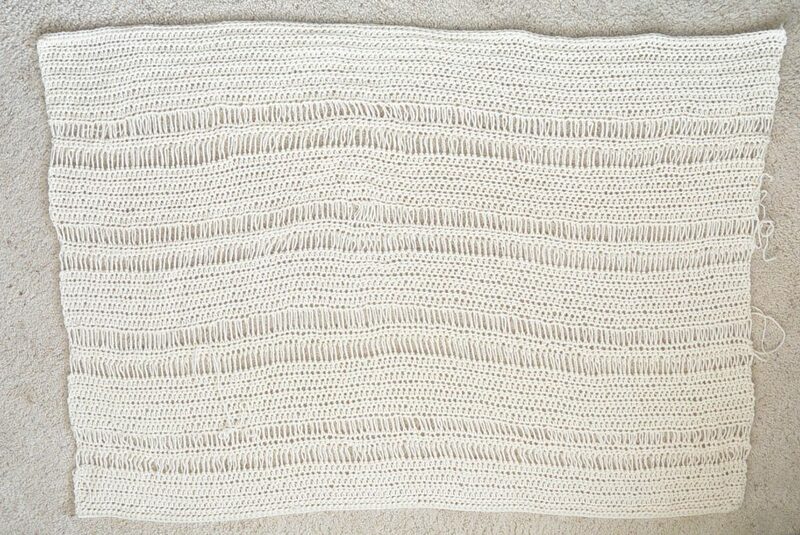 It’s been a lot of fun to use drop stitches in a few knitting projects over the last couple of years and I recently became curious about whether it was possible to get the same look with crochet. Sure enough after a simple google search, there IS a such a thing as a drop stitch in crochet! After trying out a few swatches with the drop stitch, it seemed like the perfect feature to include in a new blanket sweater type pattern. Hence, this beginner friendly Pretty Drop Stitch Crochet Cardigan! You can scroll down to see the free pattern below as well as a photo tutorial and links to my drop stitch video tutorial OR you can choose to purchase the ad-free printable version from my Etsy shop here. 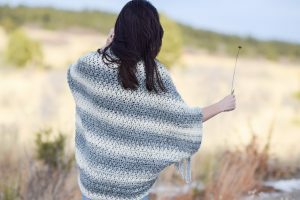 Now, you’re probably saying, “How can the drop stitch be beginner friendly?” While the drop stitch is super easy, it isn’t for a complete beginner. 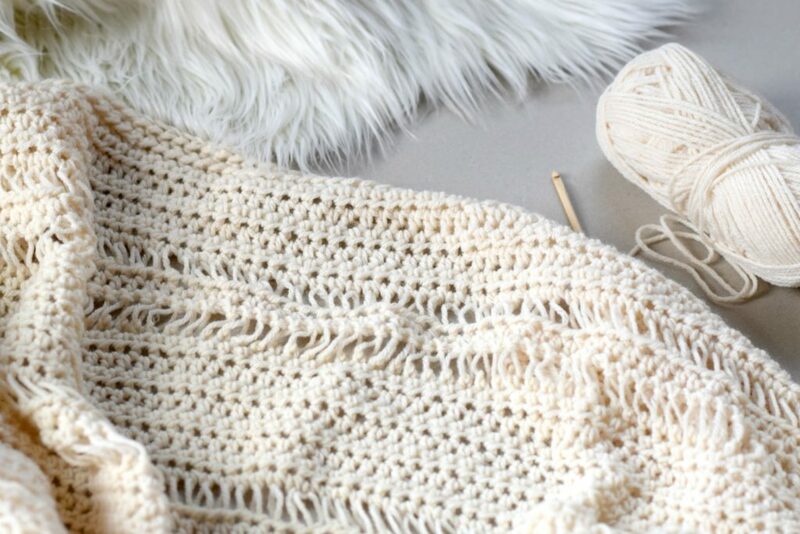 However, if you have a good grasp on basic crochet stitches, you won’t have any trouble making the drop stitches. 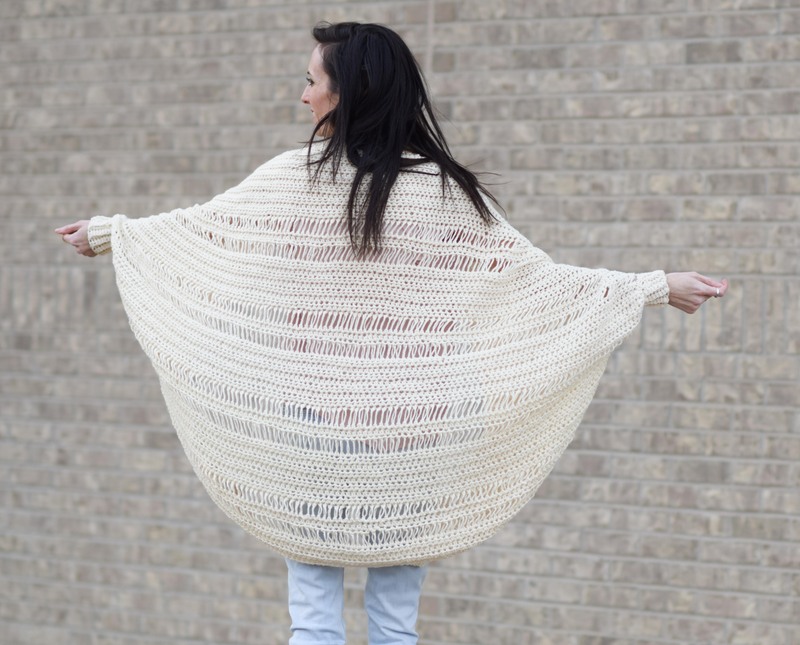 If you’re a true beginner and just know how to half double crochet and single crochet, you can make this sweater but don’t do the drop stitch rows. 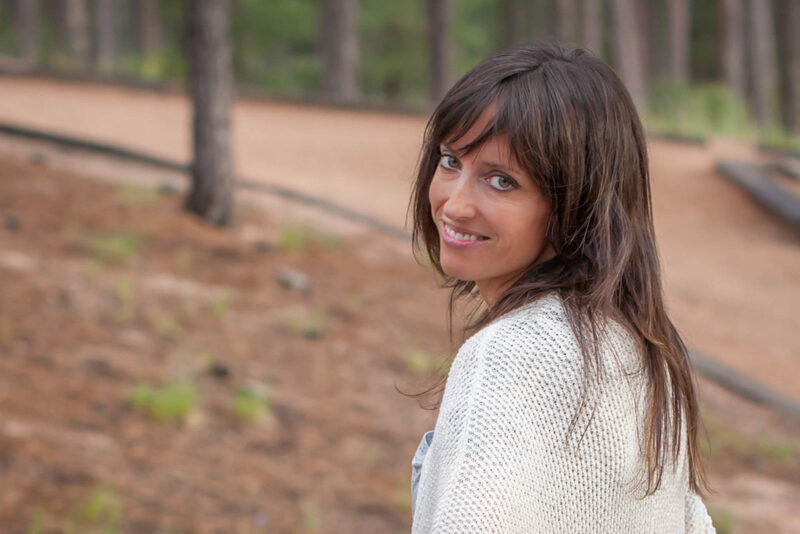 You’ll still have an awesome sweater that is simple as can be! 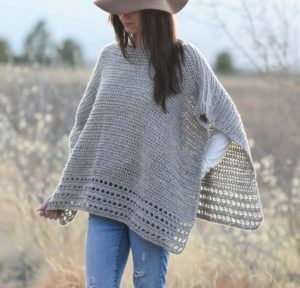 I love this crocheted sweater because it’s big, comfy and it’s made with my all time favorite color. 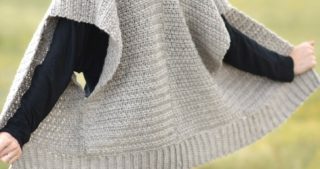 The light color really highlights the drop stitches and it shows off the stitches throughout the sweater. 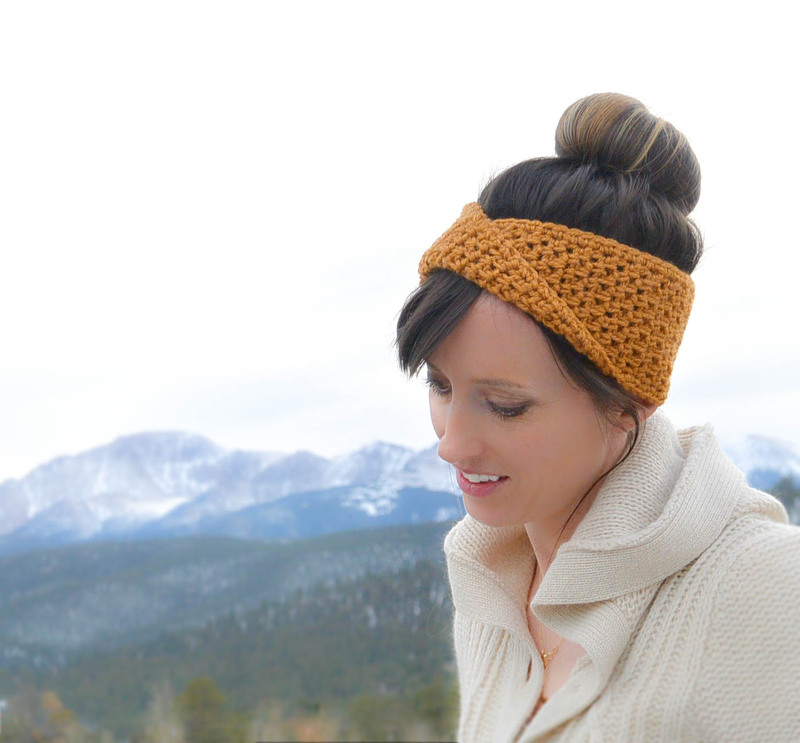 The yarn itself is soft and drapes perfectly making it a fun and easy piece to wear. 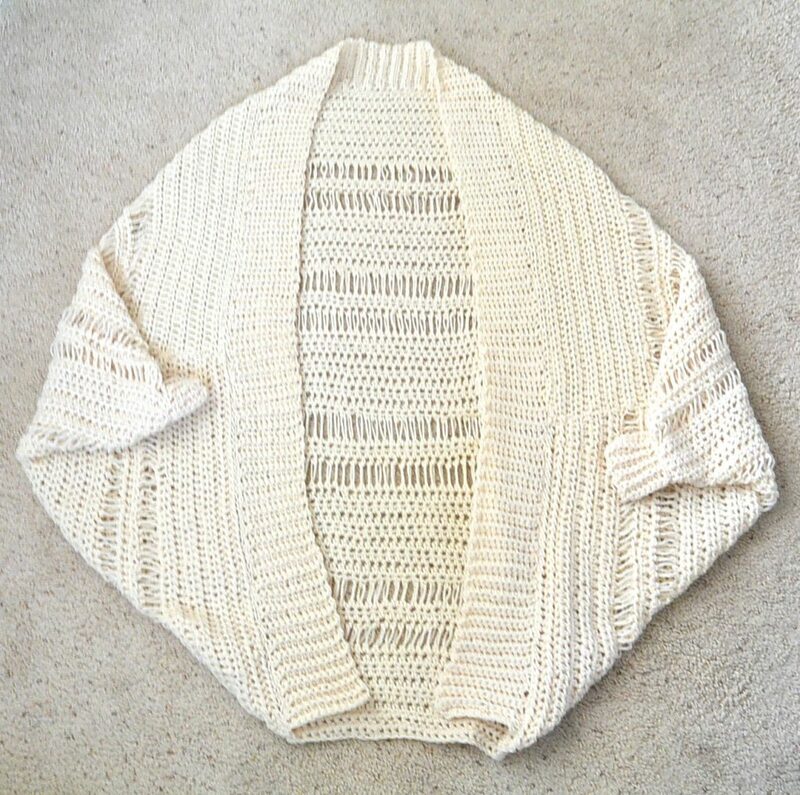 And you guys, this cardigan is made just like the Blanket Sweaters that I’ve made (like this one or this one), only you add cuffs and a collar. So easy! 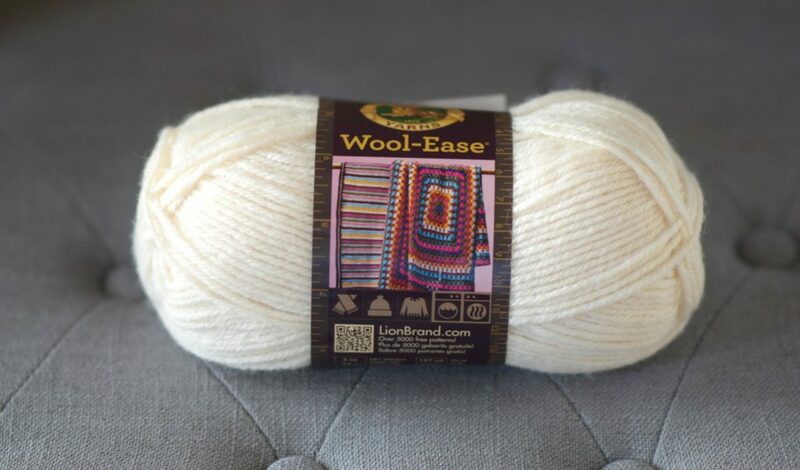 I love Lion Brand’s Wool-Ease yarn as it looks and feels like high quality yarn to me. As you can see in the photo above, it is rather large on me! I like it this way. I did make this a one size pattern since it will fit many sizes. Lately I’ve had a lot of questions asking how big I am so folks know how to compare what it will look like on them vs. myself. I never thought I’d put this out on internetlandia, but for the sake of you knowing how this thing fits – I’m 5’6″ and about 105lbs. There! 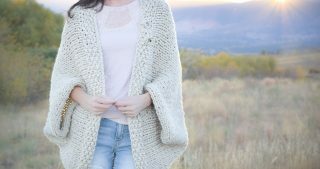 Pattern Description: A pretty, soft cardigan that drapes beautifully and is easy to crochet without any difficult shaping. 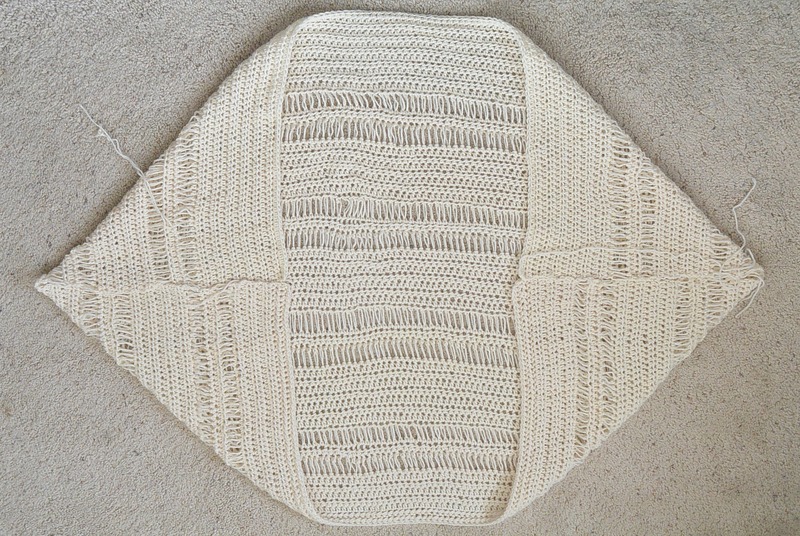 The gorgeous drop stitches add a truly unique beauty to this shrug. Next you will work the Drop Stitch portion of the pattern. Next, you will repeat the Half Double Crochet Section followed by the Drop Stitch Section. Repeat the two sections until you’ve completed four drop stitch sections total. Next, you will move onto the Final Upper Section. (Your piece should now measure approximately 32” long. If you need to add more rows, you may do so now. You may also make your piece longer than indicated in the pattern. Feel free to pin the sleeves and try it on to ensure the length is where you’d like it to be). Fold piece in half lengthwise and seam from the inner edge, outwards leaving approximately 3.75” openings on either side for the wrists/arm. The arms openings should fit comfortably but snuggly around the arm/wrist. Adjust opening size as necessary. 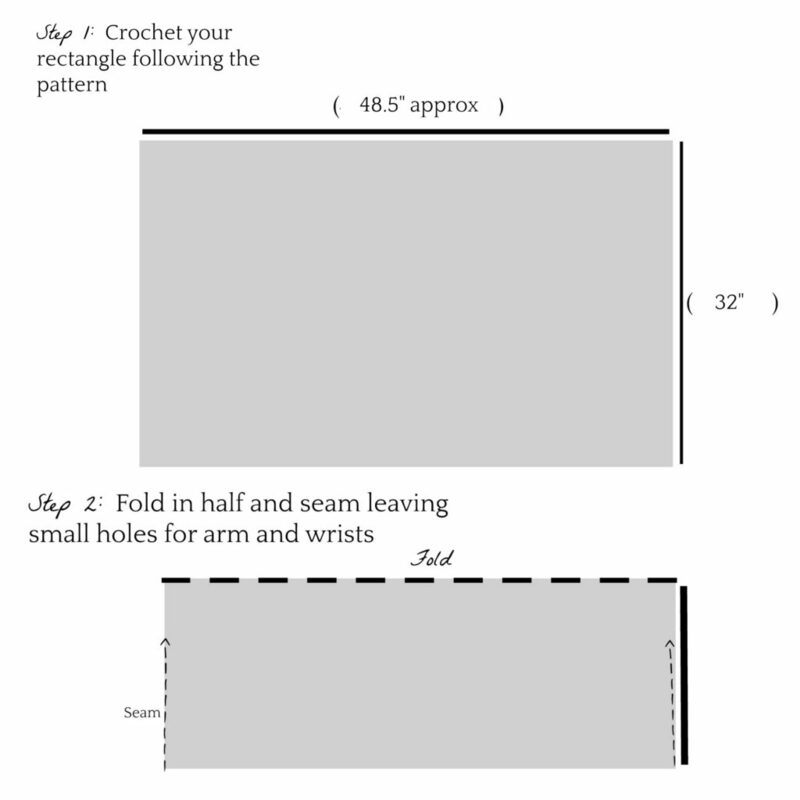 Below: Crochet your rectangle following the pattern and seam as instructed. This will make sleeves as shown when you open up the cardigan. 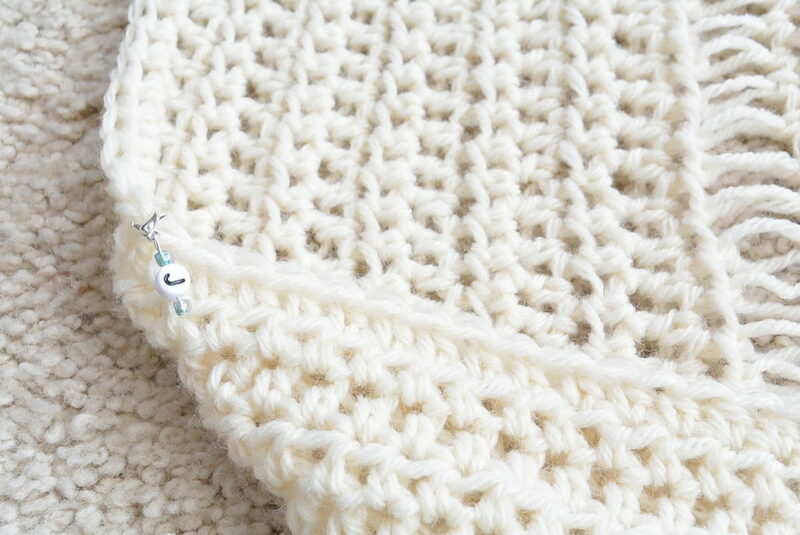 Above: Place stitch markers at each of the lower corners where the collar meets the bottom – then you will whip stitch the ribbed collar to the shrug starting and ending at these markers. Below: Notice how the ribbed collar is attached to the cardigan. Now we let’s move onto that collar! Repeat row 2 until piece is long enough to seam between the stitch markers on your cardigan. With a length of yarn and tapestry needle, whip stitch seam the collar to the inside of the cardigan between the stitch markers, working from one end to the next. Repeat this pattern until piece measure approximately 7 ¼ inches long or the length to comfortably fit around the wrist/arm. Tie off and whip stitch ends together. Weave in ends. Repeat above pattern to make second sleeve cuff. Whip stitch seam each cuff to the wrist/arm openings on your cardigan. And don’t forget, if you need more help with the drop stitch, you can see the full tutorial HERE! Oh, this sure is beautiful! I’ve never worked a crochet drop stitch so I watched your tutorial on YouTube. Thank you for the nice clear instructions – now I won’t be afraid to try it. I’m so glad that you found it easy to follow. I’m still trying to learn what makes up a good video! I think this is a great pattern. I have crocheted the Cozy Blanket Sweater for my sister who lives in Minnesota. She says she loves it because it’s like getting a hug from your sister every time she wears it. It is truly a warm sweater and she appreciates how easy it is move around in without getting in the way! Thanks for all of your wonderful patterns! I’m so happy to hear that your sister likes the Cardi and you must have done a lovely job on it! Thanks so much for letting me know. And you’re welcome for the patterns! It’s my pleasure. We older folks would know this as broomstick lace. It is lovely in your sweater. Hi Barbara! Very cool! I have done broomstick lace before and thought it was when you crochet at least two of the loops together. But that’s great to know this is also broomstick lace. Thank you! 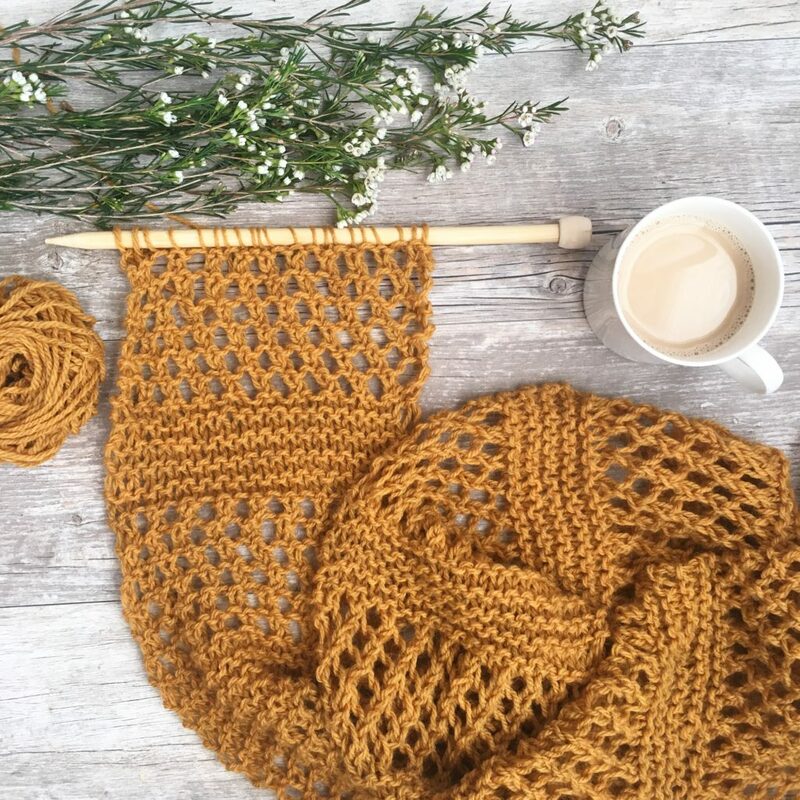 Is there a way to convert crochet into knit? I love a lot of your crochet patterns but I no longer enjoy crocheting but would love to make some of your crocheted things. This drop stitch looks similar to the knit blanket sweater kit I ordered.. I love it! I really like the way you put cuffs on this one. 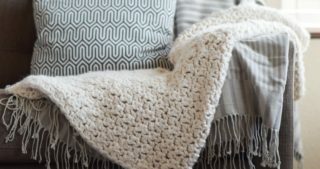 I hope you can help me with the converting crochet to knit. Thanks Jessica for such a Lovely pattern. Also thanks for video of drop stitch in crochet. Hi, in reading the pattern I can’t find row 7, should row 8 be row 7? Thank you so much for bringing that to my attention. I just corrected the pattern above and sorry for the confusion. No more late night editing! Hi Elizabeth! I’m so happy you’ve enjoyed it and I love how you got creative with the colors! I’m not sure without testing it out. I would do a little sample of each – try it with white and then black. See which one works out better or if there’s a difference. I hope that it comes out great! And thanks for sharing about the clearance needles at Michaels. That’s always a plus! Hi Jessica!! I love this pattern– it’s absolutely beautiful. I know you mentioned that it’s ‘one size fits all’, but I’m only 5’3″. 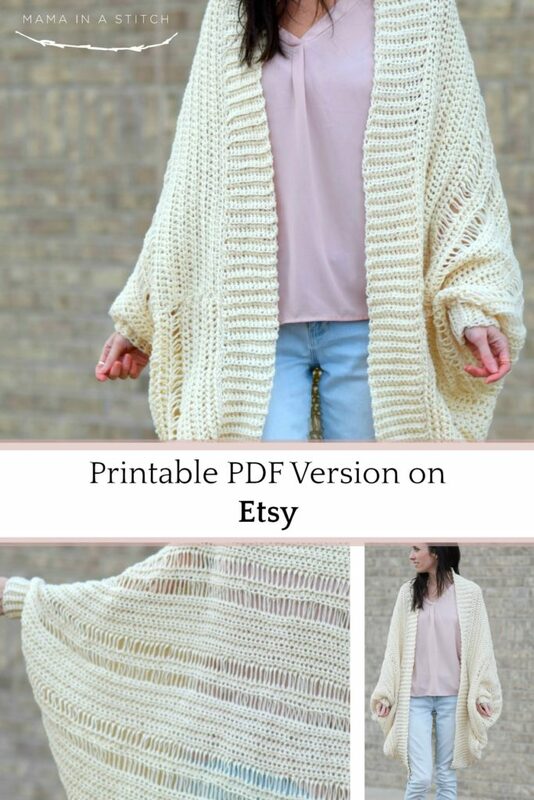 I’m thinking that this might be too big for me but I would love to make it for myself if there’s any way of making it shorter. Hi Pearl! 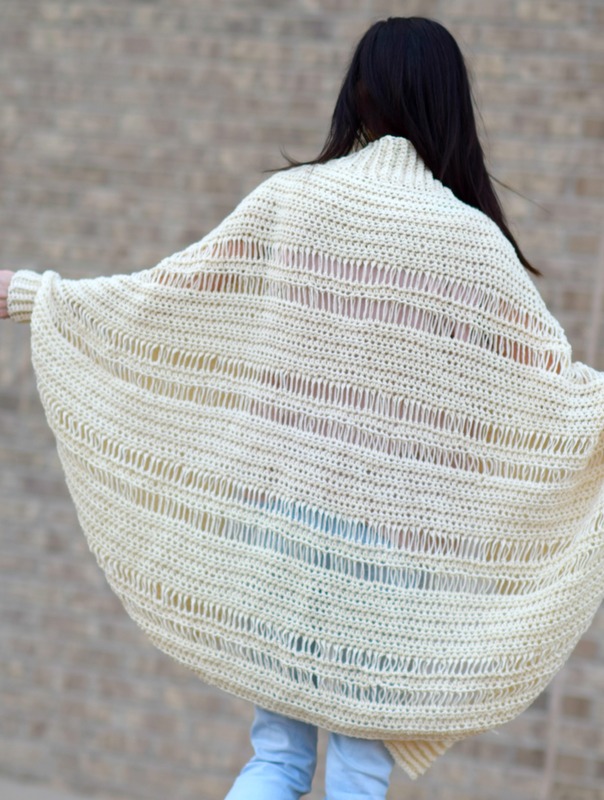 To make it shorter you would simply crochet less rows. The width would stay the same but the length would be shorter. 🙂 Thanks for your kind words friend! Thank you so much for posting your height and weight. It really helps I’m a 2x and it’s always so hard to gauge if I have to add stitches. Knowing now the dimensions and seeing how it looks on you tells me what I need to do to make it fit me. You are a sweetheart. Ahh thanks Joyce! I’m glad you find it helpful. Thanks for sharing! I plan on making this pattern today. Does it work up quickly? I’m wondering how long it takes to make? Im having a little trouble, for row 1-8 i have to turn at the end of it? Row 9 you said to turn however in your video when you do the drop stitches, you did not turn at all, do i follow your video and not turn turn or follow your written pattern and turn at row9 but not row 10?